I am very happy to inform you that new versions of our 3D libraries have been published. The greatest new feature of this release is that the Ab3d.DXEngine now supports multi-threaded rendering. This can provide an amazing performance boost - in some cases, the time required to render one frame has been reduced by more than 4 times = 400% improvement. This version also adds support for showing object outlines and provides a few improvements and additional options for rendering instanced objects. It also fixes a few bugs, especially with some hit testing use cases. The main focus of the new Ab3d.PowerToys library version is on improved camera controller. This should prevent problems with mouse rotation and movement when using custom rotation or zoom position. There is also a new QuickZoom zooming mode that provides a very fast and precise zooming option for the user. The data was created by the new benchmark test that is now part of the Ab3d.DXEngine samples. It shows the rendering 160.000 (!!!) boxes without using instancing (each is defined by its own SceneNode object). The test was executed on Intel i7 6700K CPU (4 cores with hyperthreading) and NVIDIA 1080 GTX graphics card. 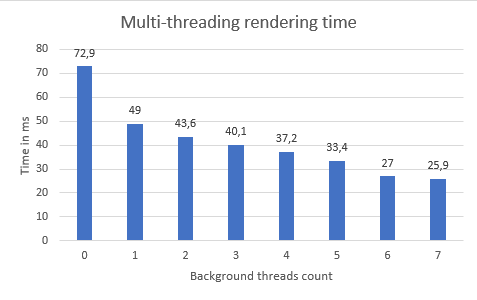 As you can see the new multi-threading capabilities can provide 4 times the performance of a single threaded rendering. It is also incredible that now it is possible to render so many individual objects with almost 60 FPS (55 FPS in this test). So, if you are rendering complex 3D scenes with many objects, you can expect great performance gains just with upgrading to a new Ab3d.DXEngine version. What is more, when rendering many 3D objects the CPU is usually the bottleneck of the whole process. But with greatly increasing throughput of the CPU, the graphics card can become the bottleneck. And because the performance of the graphics cards increases significantly with each new graphics card version, it is possible to further improve the performance with upgrading the graphics card (upgrading CPU to a new version usually do not provide such benefits). Note that multi-threading only helps when the scene contains many 3D objects - in this case many DirectX commands needs to be executed. When you are rendering only a smaller number of objects but that objects are very complex with a lot of triangles or when you are using object instancing to render many 3D objects, then the new multi-threading will not have any significant effect. It is also worth mentioning that increasing the number of used CPU cores does not improve performance indefinitely. The tests have shown that for most use cases it is not worth using more the 8 cores. Therefore the Ab3d.DXEngine initially uses all the cores but not more than 8. This value is defined by DXScene.MaxBackgroundThreadsCount property (note that it counts only the background threads so value 7 means that 8 cores will be used: 1 main thread + 7 background threads). 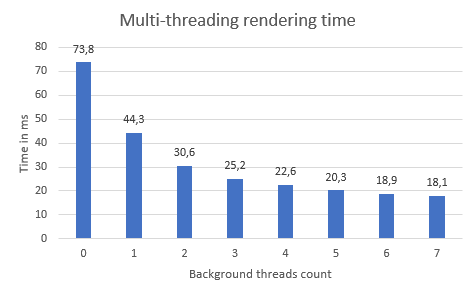 To get more information about multi-threading in Ab3D.DXEngine you can read the online help for MaxBackgroundThreadsCount. This new version also provides some improvements and additional options for rendering instanced objects. 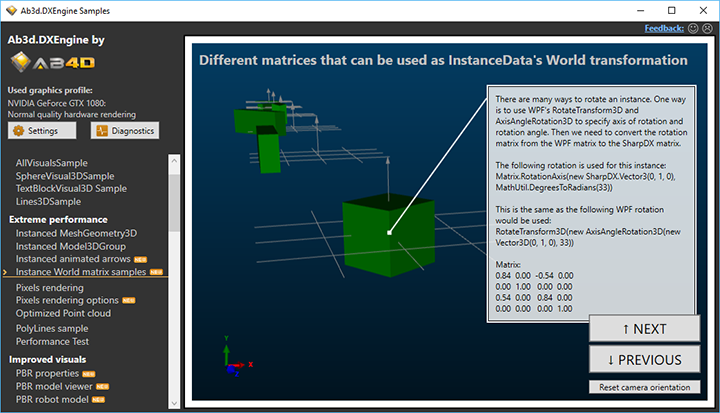 The most useful new option is to render the same instance data (same DirectX instance buffer) with using different InstancedMeshGeometry3DNode objects and providing different StartInstanceIndex and InstancesCount values for each InstancedMeshGeometry3DNode object. This way it is possible to hide multiple parts of the instanced objects without changing the instance buffer (which is a costly operation). A new sample that demonstrates that also shows how to override the color of the shown instances - this can be useful for showing selected objects with different color again without changing the instances data. As you see the new outlines can be used to provide great visual feedback to the user about the selected objects. The trick is that the outlines are visible through other 3D objects. To provide support for that, the Ab3d.DXEngine comes with a new ExpandPostProcess and a new sample that demonstrates how to alter the rendering process to render the object outlines. In this version of Ab3d.PowerToys I also wanted to update the version of the third-party Assimp importer (imports 3D objects from many file formats). Because the official release is from December 2017 I went to GitHub and get the latest source. I compiled the source into native libraries. But after doing some tests I have found out that some of the 3D files were not imported correctly. Therefore I did not publish the new version. So this release comes with the official version (from December 2017) and also with a newer version that was published with the previous version with Ab3d.PowerToys (from May 2018). Finally, I would like to say that I am following the .Net framework development news with great interest. Especially the part that with .Net Core 3 it will be possible to build WPF and WinForms apps. I have already tried to compile the Ab3d.PowerToys and Ab3d.DXEngine libraries with the preview version of the .Net Core 3 and they have both compiled fine and also run very well. This means that when an official version of .Net Core 3 will be released it will be also possible to get both Ab3d.PowerToys and Ab3d.DXEngine libraries compiled for that framework. I would like to inform you that a critical update for Ab3d.DXEngine and a minor hotfix for Ab3d.PowerToys has been published. The critical problem that occurred in the previous version was that on high DPI settings the new hit testing did not work in all use cases. If a user was using the new hit testing it may appear that the mouse was offset by some amount. This is now fixed. If you were using the previous version 3.0., then please update the library to the version 3.1. The Ab3d.DXEngine also comes with a few other improvements and new features. One of them allows using a texture when rendering instanced objects. When using textures with transparency, do not forget to set the UseAlphaBlend property on the InstancedMeshGeometryVisual3D to true. Also, in the case of rendering semi-transparent instances, they need to be sorted so that those farther away from the camera are rendered first (are defined first in the InstancesData array). The other new feature is that MeshObjectNode can now render meshes with multiple SubMeshes defined. This means that you can create one giant vertex buffer and one index buffer and then use SubMeshes to define which triangles in those two buffers will be rendered with which material. This provides an optimal way for the graphics card to render objects. What is more, it is very easy and super fast (almost at no cost) to change which triangles use which material or to change a material. This was already used by the DXEngine when a frozen Model3DGroup was rendered - in this case DXEngine combined all the meshes into one single vertex and index buffer and then defined SubMeshes for each used material. Now, this can be also achieved manually with using MeshObjectNode and SubMeshes. There are two new samples that demonstrate that. One shows a simple animation that changes SubMesh properties. The other new sample shows an efficient way of selecting a part of a mesh with changing its color. Usually, this is done with moving the selected triangles from the original mesh into a new mesh. The new mesh is then shown with the selected material. For complex meshes this is very inefficient. When using SubMeshes the same effect can be achieved with almost no performance cost. There is also a new sample that shows how to efficiently create huge height maps. The easiest way to show height maps is to use HeightMapVisual3D object from Ab3d.PowerToys library. But when creating huge height maps, this approach is very inefficient because it requires a lot of memory and takes long time to initialize (first MeshGeometry3D is created for WPF 3D objects and then this is converted into DirectX buffers). The new sample shows how to directly create DirectX buffers and then show the height map with created buffers. This shows that Ab3d.DXEngine is build to provide great support for the most demanding and complex DirectX use cases. And all that power can be used from the .Net application. The full list of changes can be found in DXEngine versions history page. As mentioned before, the Ab3d.PowerToys also got a minor hotfix. This fixes two issues. The first one was that in case of using OrthographicCamera and negative NearPlaneDistance value, then some 3D lines may not be rendered. Another fix improves the FitIntoView method when there are no WPF 3D objects in the scene (there are only DXEngine SceneNodes objects). If you are using OrthographicCamera and are manually setting the NearPlaneDistance, then it is recommended to update to the latest version v8.2.6863. I am very excited to finally release a new major version of the Ab3d.DXEngine library and a new big release of the Ab3d.PowerToys library. The list of major new features includes support for Physically Based Rendering (PBR), significantly improved hit-testing, better shadow rendering and many other performance and usability improvements. The new version also uses the latest version of SharpDX (v4.2). Standard materials define diffuse color, specular color and specular power. In most cases this allows rendering quite realistic 3D scenes. But because this lighting model is using many simplifications it cannot provide a very realistic rendering. To solve that, some bright minds dug into the lighting physics and based on what is really going on a Physically Based Rendering (PBR) was "born". In this lighting model the major two properties that define how material is shown are metalness and roughness. Metalness distinguishes between metallic and non-metallic objects. This has the major effect on how much light is reflected and how much is absorbed and returned as diffuse light. Roughness defines how clearly the environment is reflected and how big and bright the specular shiness is. 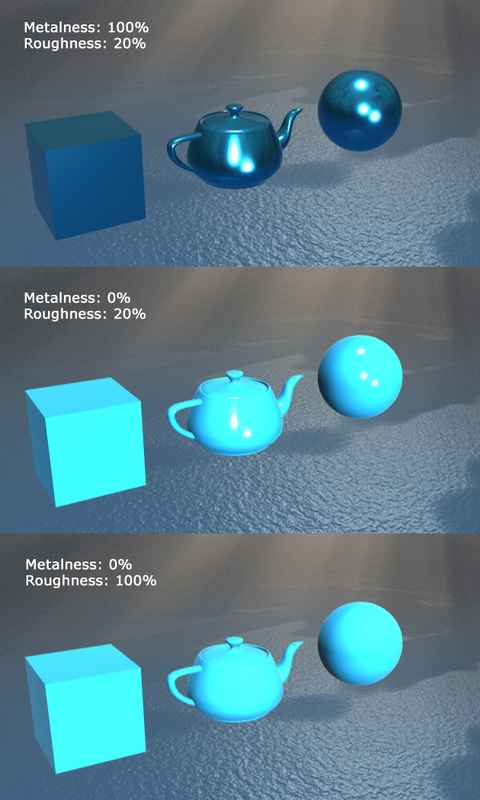 In PBR it is possible to use textures to define different metalness and roughness values for different parts of the model. 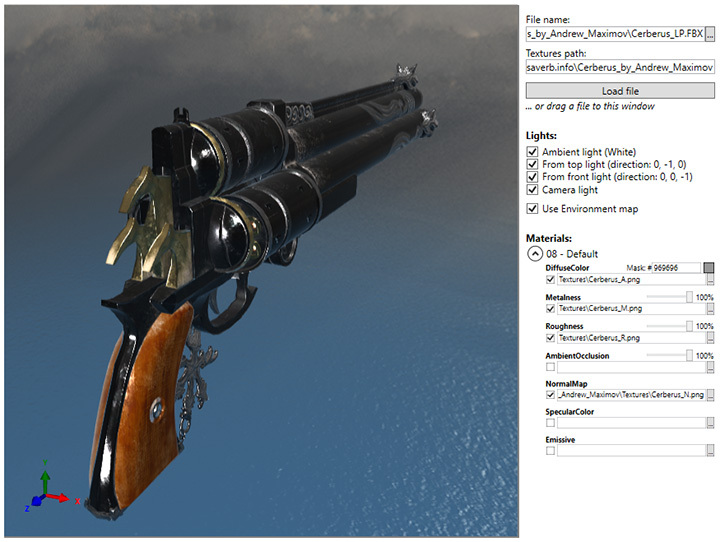 This can be nicely seen in the image above where the wooden parts or the pistol are rendered differently from the metallic parts because they have different metalness values. Besides metalness and roughness, the PhysicallyBasedMaterial in Ab3d.DXEngine also supports base color (diffuse color), emissive map, ambient occlusion map and normal map (also called bump map). Another great new feature of the new version of Ab3d.DXEngine is much better support for hit testing. Hit testing is used for all the interactions of the mouse or touch with the 3D objects. 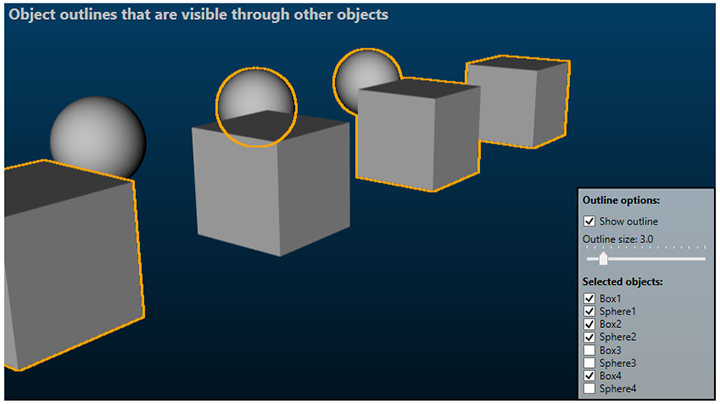 In hit testing, a ray is created from the mouse or touch position and then the ray is checked against the 3D scene and the hit objects are returned. In previous versions of the library all the hit testing was done by using hit testing build into WPF. This worked well in most cases. But it was not able to use it for optimized SceneNode objects that were not created from WPF objects because those objects were not "visible" from WPF. 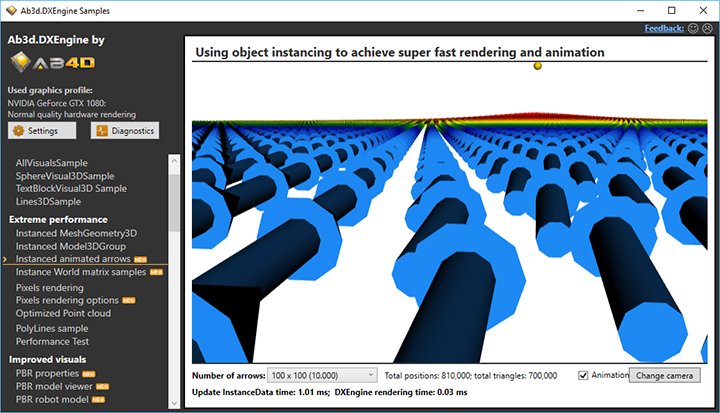 Also, hit testing on instanced objects required that WPF 3D objects were created for each instance. This greatly increased initialization time and memory usage. Another significant performance improvement is related to the use of the IsVisible property. This property is defined by all the objects that are derived from the BaseVisual3D objects from Ab3d.PowerToys library. This includes most of the Visual3D objects (BoxVisual3D, SphereVisual3D, ect. ), all 3D line Visual3D and some other objects. When you want to hide an object, it is very convenient to just set IsVisible to false. To show the object again, you can just set IsVisible back to true. What happened behind the scenes was that the object that was hidden was removed from the 3D scene. When IsVisible was set back to true, the object was added back to the 3D scene. This meant that when complex objects were hidden and shown, all the DirectX resources were disposed and then created again. So this quite common operation was not as fluent as it should be. The new version of Ab3d.DXEngine greatly improves that because now setting the IsVisible property to false does not change the 3D scene but just marks the object to be skipped when rendered. This way hiding and showing an object is now an instantaneous action. To provide advanced IsVisible processing to any Model3D object and not only objects derived from BaseVisual3D, the new Ab3d.PowerToys library provides a new ContentVisual3D object. For example, ContentVisual3D can be used to show or hide a 3D object that is read from a file (usually defined with a Model3DGroup). The new IsVisible processing also has a disadvantage that I need to mention here. 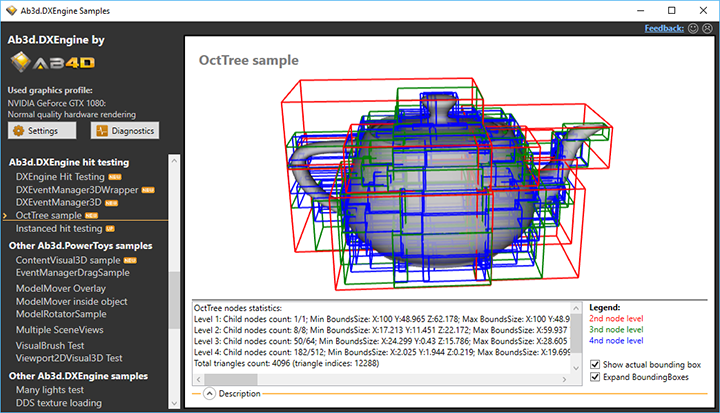 Because the 3D scene is not changed when IsVisible is set to false, this means that DXEngine will not render the object, but it will be still present in the WPF 3D objects tree. Therefore, if you are using WPF hit testing, you might get a hit result on an object that is actually not shown. 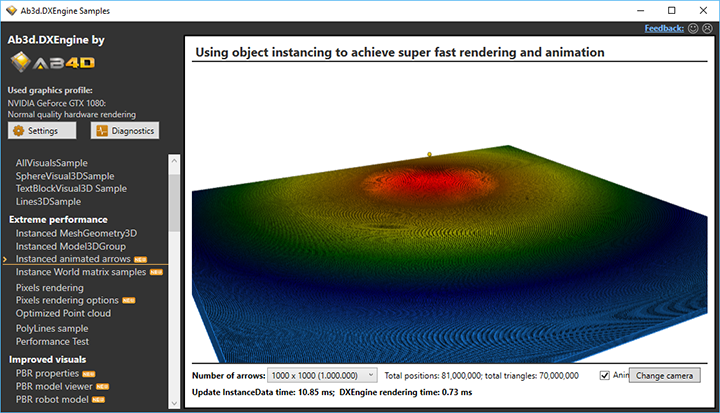 The easiest way to solve that is to use hit testing from DXEngine. You can also filter the hit objects by checking if they are derived from BaseVisual3D and then checking the value of IsVisible property. It is also possible to disable the new IsVisible processing. If you are using PixelsVisual3D to render many pixels, you will be happy to hear that now it is possible to specify a different color and a different size for each of the pixels. Also, pixels can be quickly hidden with setting pixel's alpha color value to 0 or size to 0. Another bigger change with DXEngine is that the SharpDX library that is used as a managed DirectX wrapper has been updated from v4.0.1 to v4.2. This means that you will need to update this library. You can get the new version from NuGet or from the same folder as the DXEngine library. This knowledge is very important for performance because it teaches you how to use instancing for scenarios that you may not think of. And using instancing instead of many simple objects is in many cases the most beneficial performance improvement that you can do. Because there are many WinForms users of Ab3d.DXEngine, I have updated the WinForms samples project and added code that shows new efficient ways to use the rendering engine. The samples also got new code comments. So far I have been mostly wringing about Ab3d.DXEngine. But also the Ab3d.PowerToys library got tons of new features and capabilities. One of the most important new one is that the library now comes with the new version of Assimp importer (http://www.assimp.org or https://github.com/assimp/assimp). This means that many new file formats are supported - the new list of supported file formats that can be imported is really long: .3d, .3ds, .3mf, .ac, .ac3d, .acc, .amf, .ase, .ask, .assbin, .b3d, .blend, .bvh, .cob, .csm, .dae, .dxf, .enff, .fbx, .glb, .gltf, .hmp, .ifc, .ifczip, .irr, .irrmesh, .lwo, .lws, .lxo, .md2, .md3, .md5anim, .md5camera, .md5mesh, .mdc, .mdl, .mesh, .mesh.xml, .mot, .ms3d, .ndo, .nff, .obj, .off, .ogex, .pk3, .ply, .pmx, .prj, .q3o, .q3s, .raw, .scn, .sib, .smd, .stl, .stp, .ter, .uc, .vta, .x, .x3d, .x3db, .xgl, .xml, .zgl. Also, the list of file formats you can export to has been extended significantly. You can now export to the following file formats: dae, x, stp, obj, obj, stl, stl, ply, ply, 3ds, gltf, glb, gltf, glb, assbin, assxml, x3d, fbx, fbx, 3mf. If you were already using Assimp importer and would like to switch to a new version, note that the new version has different native libraries requirements. See the comments in the samples or the Ab3d.PowerToys.Assimp.chm help file for more info. There are also many other features or improvements. For example, if you were using WireGridVisual3D to show a wire grid, you will be happy to hear that now it is possible to define different major and minor grid lines. This makes the grid much nicer and required a minimal change in the code. To get a full list of changes, see the Ab3d.PowerToys versions history web page. Also, check the Ab3d.DXEngine versions history. Commercial users can get the new version from their User Account web page. Others can download the new evaluation version. The best way to know more about the new features is to check the new samples projects. As always, the new samples are marked with NEW icon and the samples that are significantly updated with UP icon. Let me finish with a few words about my future plans. One of the things that I would like to implement as soon as possible is to create a special version of the dll that could be distributed through NuGet and would provide evaluation and commercial version. This would also allow me to move the samples to the GitHub. I also have a few ideas on how to provide some solutions to improve performance in some commonly used scenarios. I also want to update the support for Oculus Rift (also with help from some customer provide support for Avatars) and add support for OpenVR. And there are many other great new things waiting on my todo list. 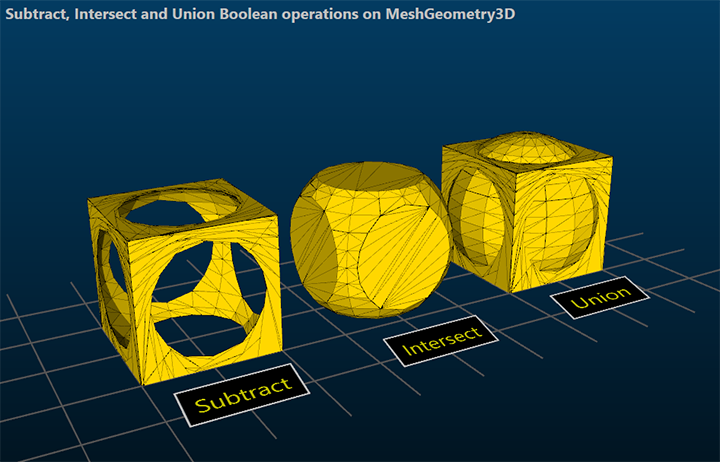 I am happy to inform you that a great new update of main 3D libraries is available. This time most work was done to improve the Ab3d.DXEngine - DirectX rendering engine. Added support for normal mapping (also called bump mapping). Added rendering 3D lines with patterns (enables rendering of dashed and dotted 3D lines). Improved texture loading with support for loading DDS files. Improved Assimp importer that can now also read and play keyframe and skinned animations from many 3D file formats (including fbx and dae). Normal mapping is now supported with a new MultiMapMaterial class. This material defines a list of maps or textures where for each map its usage type is defined. 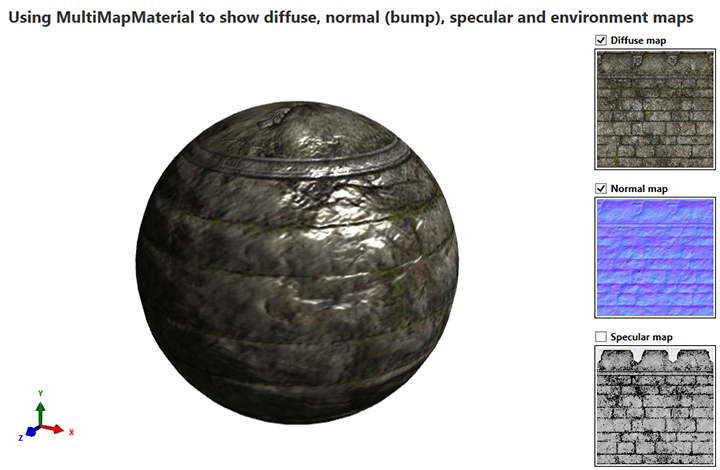 This way it is possible to define a material with diffuse, normal, specular and also environment map. A drawback of the current version is that shadow rendering is not yet supported where rendering objects with MultiMapMaterial . 3D lines rendering is greatly improved in this version of Ab3d.DXEngine. 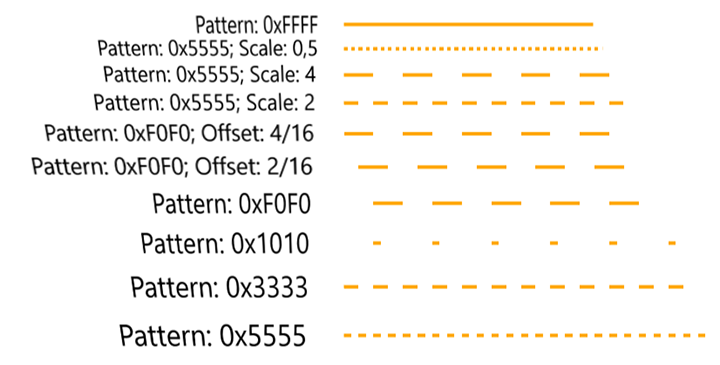 There is now a new ILinePattern interface that defines LinePattern, LinePatternScale and LinePatternOffset properties. This not only allows rendering dashed and dotted lines but with changing LinePatternOffset it also provides an option to animate the dashed lines - for example, to show a way or direction. Also, this version now supports full hardware acceleration of rendering connected 3D lines (polylines). This means that you do not need to use special properties to render connected 3D lines as disconnected 3D lines anymore. What is more, both Ab3d.DXEngine and also Ab3d.PowerToys now have a new MitterLimit property that defines when a sharp line connection is turned into beveled (cut) line connection. 3D models can be read into your application with using Assimp importer library that can read data from almost any 3D file format. But until now only static models can be imported. The only way to play animations was to use Ab3d.Reader3ds library and play animations stored with 3ds files. But the new version of Ab3d.PowerToys.Assimp library supports reading keyframe and also skinned animations. There is also a new AssimpAnimationController that can play both keyframe and skinned animations. This way it is possible to read animations from almost any 3D file format that support storing animation data. A lot of work was also dedicated to providing an efficient way of rendering many millions of pixels - the so-called point clouds. The new OptimizedPointMesh class can optimize rendering of huge point clouds in two ways. First, it can determine which parts of point cloud are visible to the camera. Second, on the visible parts it can check the following positions and if they would be rendered so close together that the distance on the screen would be less then one pixel, they are rendered only once as only one pixel. Those two optimizations can in most of the cases provide huge performance improvements (but still, investing in a high-end graphics card is the most efficient way to deliver substantial performance gains). When 3D models with very detailed textures (for example 4096 x 4096) are loaded, the texture initialization can take quite a lot of time and memory. Most of the time and memory is used to create mipmaps of the texture. Those are required to get efficient color sampling on the graphics card. To improve this, modern 3D games use DDS texture formats. This file format is optimized for the graphic card and also alredy include mipmaps. The new version of Ab3d.DXEngine provide a few easy ways to load DDS textures instead of standard png or other files. This can significantly improve load time. Implemented rendering materials with diffuse, normal (bump) and specular texture. Note: does not work yet with shadow rendering. Added MultiMapMaterial that can be used to render material with diffuse, normal, specular and environment reflection texture. Added ILinePattern interface with properties that define line pattern: LinePattern, LinePatternScale and LinePatternOffset. Implemented ILinePattern with LineMaterial object. Added LinePattern, LinePatternScale and LinePatternOffset to DXAttributeType. This way it is possible to specify line pattern parameters on LineVisual3D objects with using SetDXAttribute extension method. Added support for rendering connected 3D lines (PolyLineVisual3D, etc.) with full hardware acceleration. Note that lines with arrows are not rendered with full hardware acceleration. Changed default value of DXScene.RenderConnectedLinesAsDisconnectedLinesThicknessLimit from 3 to 0 - so connected lines that are thinner than 3 are not rendered as disconnected lines by default. Added IPolyLine interface with IsPolyLine and MiterLimit properties. Updated LineMaterial to implement IPolyLine interface. Improved time and memory consumption when reading textures. Added Ab3d.DirectX.TextureLoader.LoadShaderResourceView method that can be used to load textures from standard image files (png, jpg, tiff, gif, bmp) and from DDS files. Added Ab3d.DirectX.TextureLoader.CreateShaderResourceView method that can create ShaderResourceView from texture stored in byte array (for cases when bitmap is read from a stream). Added static bool LoadDdsIfAvailable field to WpfMaterial. When LoadDdsIfAvailable us true, then the texture loader will check if there is a DDS file with the same name but dds file extension. In this case the DDS file will be loaded. Using dds files can greatly improve required load time and memory usage. Added static CreateTexture2D method to WpfMaterial that creates a ShaderResourceView from the specified WPF BitmapSource. Created OptimizedPointMesh class that can be used to show point cloud and can dynamically reduce the number of rendered positions to improve rendering performance. Make CalculateCameraPlanes on DXScene public. The method calcualates zNear and zFar values for the specified camera. Added ParentNodeChanged and ResourcesInitialized events to SceneNode. Added ForegroundRenderingQueue to DXScene. This is a new rendering queue that is rendered after GeometryRenderingQueue but before TransparentRenderingQueue. Set default values of ReadZBuffer and WriteZBuffer properties on PixelMaterial to true. Removed ScreenSpaceLineNode constructors that takes both isPolyLine and LineMaterial as parameters - IsPolyLine values is now provided only by LineMaterial parameter (when it implements the IPolyLine interface). Added CustomRenderableNode and CustomRenderablePrimitive. Those two SceneNode classes simplify using custom rendering logic to render 3D objects with providing a callback method that is called to render the 3D object (used can call Draw calls on DirectX device in the callback method). Added DXAttribute OnSceneNodeCreatedAction. Its value can be set to a callback method defined by an Action&lt;SceneNode&gt;. The callback method is called after a SceneNode is created from the WPF object. Added DXAttribute OnDXResourcesInitializedAction. Its value can be set to a callback method defined by an Action&lt;object&gt;. The callback method is called after the specified DXEngine's resource is initialized and DirectX resource objects are created. Fixed problems when color from PixelEffect is used to render 3D lines instead of the color defined in the LineColor property (and vice-versa). Added dpiX and dpiY parameters to DXView.RenderToBitmap method (they default to 96 but can be changed by the user). Renamed Ab3d.DirectX.ContexStatesManager class to Ab3d.DirectX.ContextStatesManager to fix spelling of the class. Added BackgroundObjectsCreation sample that shows how it is possible to initialize 3D objects on the background thread so that when they are shown the UI thread is not blocked for a longer time. Added Frustum culling sample. 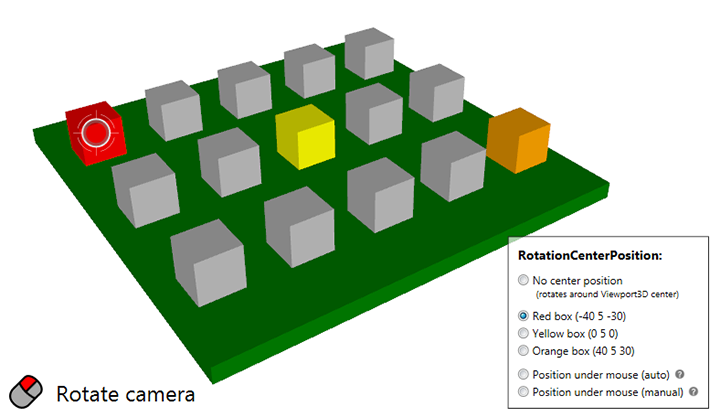 The sample shows how to determine which 3D objects are visible in the camera view. Improved WinForms sample to show how to use DXViewportView in WinForms with SharpDX.RenderForm. Using DXViewportView in WinForms application allows easy conversion of samples from Ab3d.DXEngine and Ab3d.PowerToys to WinForms application. Added MiterLimit property to PolyLineVisual3D, MultiPolyLineVisual3D, RectangleVisual3D and LineArcVisual3D (all lines derived from BasePolyLineVisual3D). The MiterLimit value specifies when the mitered line joint is changed into beveled line joint. Added support to read 3D lines from obj files with ReaderObj. Before lines can be read, the ReaderObj.ParentModelVisual3D property must be set. Lines color is get from material's diffuse color (or ReaderObj.DefaultMaterial). Line thickness is always set to 1. Changed type used for FrameNumber in animation classes from int to double. Fixed Camera.GetMousePositionOnPlane method when using OrthographicCamera and when camera's Offset is not zero (Offset is changed when camera is moved). Added a new constructor to Ab3d.Utilities.Plane class that takes a position on a plane and plane's normal. Added static bool ImmediatelyLoadTextureFiles field to MaterialTypeConverter to control how the BitmapImages are created (can prevent locking the read file because file is in use). See comments for the field for more info. Added protected OnMouseMove, OnMouseButtonUp, OnMouseButtonDown and OnMouseWheel to MouseCameraController. This make it possible to use MouseCameraController in WinForms application (with SharpDX.RenderForm). Changed Ab3d.Utilities.Plane class to use a more standard a*x + b*y + c*z + d = 0 equation instead of a*x + b*y + c*z = d. If you are creating Plane object with a, b, c and d parameters, then you will need to flip the sign of the d parameter. Added support to read bones and skeleton information. Added support to play keyframe and skeletal animation (use Ab3d.Assimp.AssimpAnimationController that is defined in Assimp folder in main Ab3d.PowerToys samples project). Set name of the created WPF materials from names defined in the file. The material's name can be read with material.GetName extension method (defined in Ab3d namespace). Added GetAssimpMeshForGeometryModel3D, GetWpfMaterialForAssimpMaterial and GetAssimpMaterialForWpfMaterial to AssimpWpfConverter. I am happy to announce that a major new version of Ab3d.PowerToys and a new version of Ab3d.DXEngine have been released today. 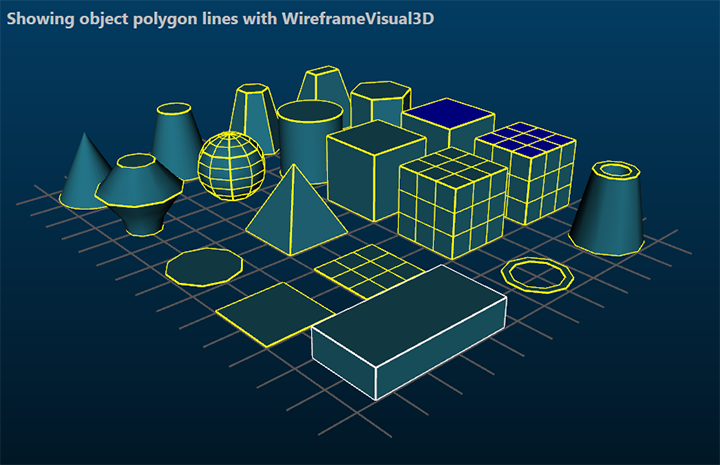 added support for showing object edge lines instead of triangle wireframe. Let’s describe those features with more details and with some screenshots. 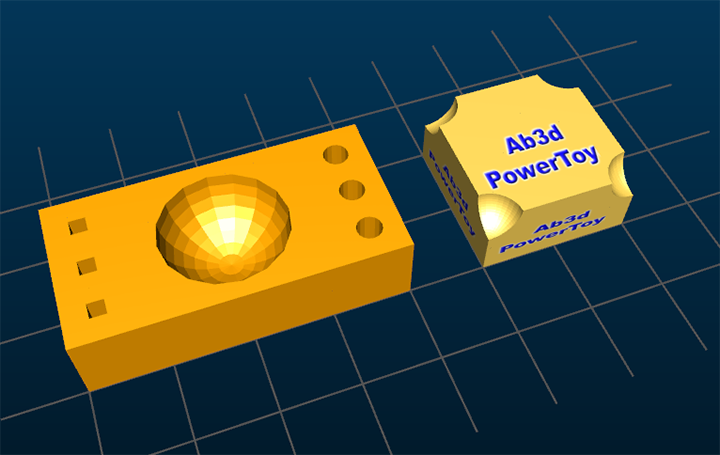 In the previous version of Ab3d.PowerToys it was only possible to rotate around the Viewport3D’s center position. Zooming in and out was also possible only to the center position. With the new version it is very easy to specify custom rotation and zooming position. It is also possible to rotate around or zoom into the position under the mouse cursor. As you can see from the image, it is also possible to show a marker that shows around which position the cameras is rotated. This marker can be fully customized. Good camera control is at the heart of a good user experience. And to make the camera control great for even the most demanding users, it is now possible to add support for 3D mouse from 3DConnexion. This allows experienced users to be much more productive and to control the camera in the best possible way. 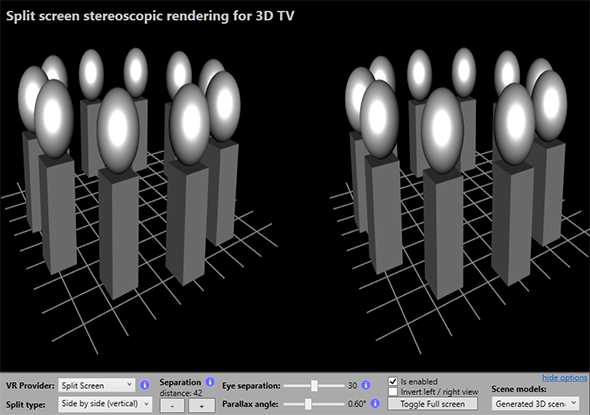 Ab3d.PowerToys now includes two new very powerful utilities to manipulate 3D models. The right object also shows texture on a 3D model. The texture coordinates for that model were calculated with new texture generation algorithms – in this sample a cubic projection was used. 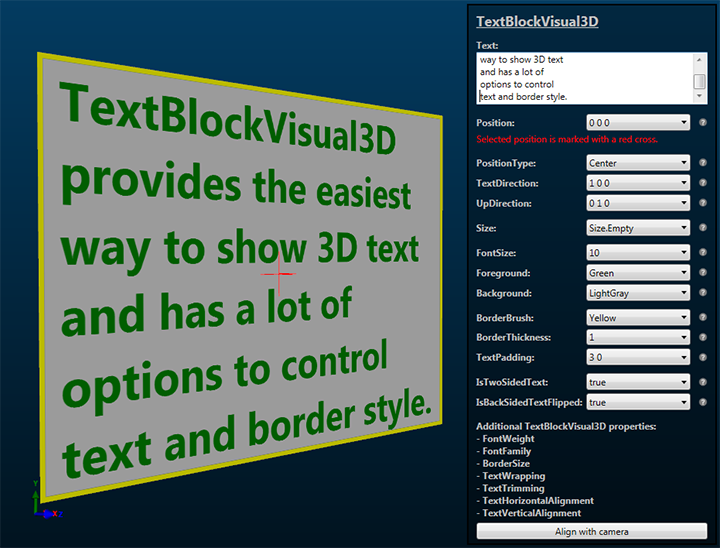 <visuals:TextBlockVisual3D Position="-150 -45 100" PositionType="Center"
The new version also adds great support for camera and model animations. This allows creating nice camera transitions from one view to another. The samples project has also been improved. It has many very interesting new samples. For example one shows how to create billboards – rectangles with text or images that are always oriented towards the camera. The other shows how to select 3D lines with moving the mouse close to the line (not onto the lines which can be problematic in case of thin lines). Also note the NEW and UP icons in the list of samples for new and updated samples. To get a better understanding of the sample, check the sample description and comments in code behind. There are also many other new features, improvement and bug fixes. For a full list of changes see the version history web page. Some of the new features of Ab3d.PowerToys also require an updated Ab3d.DXEngine. If you want to get full hardware accelerated rendering of edge lines, then you need a new version of Ab3d.DXEngine. The new version can also improve sharpness of rendered 3D scene with setting UseLayoutRounding property on DXViewportView to true. This should prevent putting the rendered image to sub-pixel boundaries. Another change in the new version Ab3d.DXEngine is that it now uses the latest version of SharpDX library – version 4.0.1. This also means that you will need to update the references to SharpDX. You can use the one from NuGet or the dll-s that are supplied with Ab3d.DXEngine. In case you used version 2.6.3 before, you will also need to add reference to SharpDX.Mathematics assembly. I really hope that the versions of the libraries will serve you well and allow you to easily add great new features to your applications that will amaze your customers. I am very happy that I can present you some great new features of new versions of Ab3d.PowerToys and Ab3d.DXEngine. 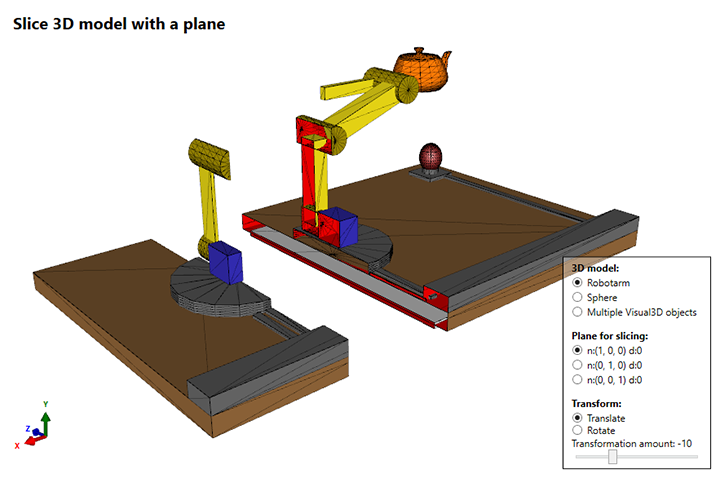 - Export WPF 3D models to Collada (.dae), obj, ply and stl files (using Assimp exporter). 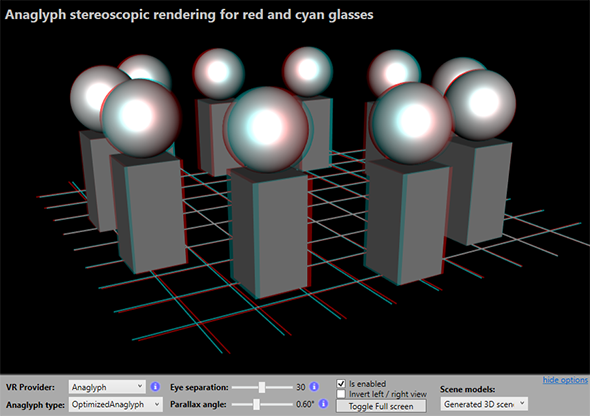 Ad3d.DXEngine just got support for split-screen and anaglyph rendering. Those are the first two steps into the virtual reality world. I also checked the requirements for NVIDIA 3D Vision. But unfortunately it requires an exclusive full screen rendering mode and does not work in maximized borderless window mode that is the only full screen mode possible by WPF. But the good news is that it looks like it will be possible to add support for Oculus Rift and Vive. So if you like virtual reality, stay tuned for the future version. DirectX usually uses multi-sampling (MSAA) that improves the quality of the edges with producing nice anti-aliased edges. Instead of using multi-sampling it is also possible to use post-processing techniques (for example FXAA or SMAA) to produce nice soft edges. But neither multi-sampling nor anti-aliasing post processing do not solve the problem where small details are can be lost when objects are rendered far away from the camera. 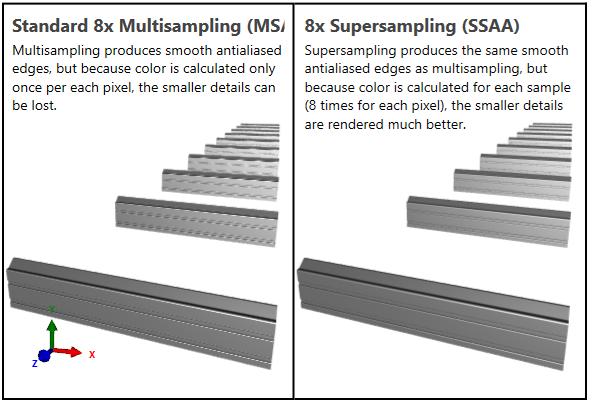 The solution to this problem is to use super-sampling – as shown on the rights side. Super-sampling solves this problem with calculating color (executing pixel shader) for each sample – this means multiple times for each pixel. This effectively gives the same results as if the image would be rendered at a bigger resolution and then scale the image down to the target resolution. I would also like to mention that the new version of Ab3d.DXEngine library improves support for rendering over remote desktop. Previously the 3D scene was visible through remote desktop only when DirectXOverlay PresentationType way used. But this presentation type has a serious drawback because it does not allow to mix 3D content with other 2D WPF content – for example render 2D controls on top of 3D scene. With the new version, the remote desktop works well also with DirectXImage PresentationType – this allows showing 3D scene that is mixed with other 2D controls. Note that this requires .Net target framework 4.5 or later and using the .net 4.5 build of Ab3d.DXEngine library. Simplified setting line depth bias with SetDXAttribute(DXAttributeType.LineDepthBias, depthBias) method - this can prevent z-fighting when rendering 3D lines on top of solid objects. Added Ab3d.DirectX.DXDiagnostics.CaptureNextFrame and IsCaptureFrameSupported methods to programmatically captures the next rendered frame with Visual Studio Graphics Debugging (this also allows capturing frames for DirectXImage PresentationType). Added support for Visibility property on objects derived from UIElement3D . Added IsMaterialSortingEnabled property to DXScene to control if sorting objects by their materials is enabled. Enabling sorting improves performance because objects with the same materials are rendered one after another (this reduces the required DirectX state changes), but when you want to have determined order of rendering you can disable the sorting. Improved automatically updating WireframeVisual3D when LineThickenss or LineColor is changed. Improved hardware rendering of 3D lines - depth problems could occur when long lines are crossing the near plane (one end of the line is behind the line). Added Clone method to GraphicsProfile to simplify creating your custom graphic profiles that are based on default graphics profiles. Added ExecutePixelShaderPerSample to DXScene and to GraphicsProfile - this allows turning multisampling into supersampling for better shader quality (used by new UltraQualityHardwareRendering). Prevented throwing exception when ImageBrush uses a texture with relative Uri. Fixed using EmissiveMaterial properties on materials that do not have DiffuseMaterial (under some circumstances). Fixed using Opacity or alpha value for EmissiveMaterial. Changed some properties and methods in RenderingContext class and in some RenderingSteps - if you are an advanced DXEngine user and use custom rendering steps, you can contact us to get a full list of changes. This release also brings many new features to the Ab3d.PowerToys library. The most important new feature is added ability to export WPF 3D models to Collada (.dae), obj, ply and stl files. This was really a highly requested feature. It allows creation of 3D models with WPF 3D and Ab3d.PowerToys that can be exported and used in some other 3D modelling application. The code that does the exporting is using the great open source Assimp library. Added support for texture coordinates generation in extruded mesh - use new ExtrudeTextureCoordinatesGenerationType. Added ConeTubeVisual3D - it can be used to create Visual3D that represents a 3D Tube with different top and bottom radius. 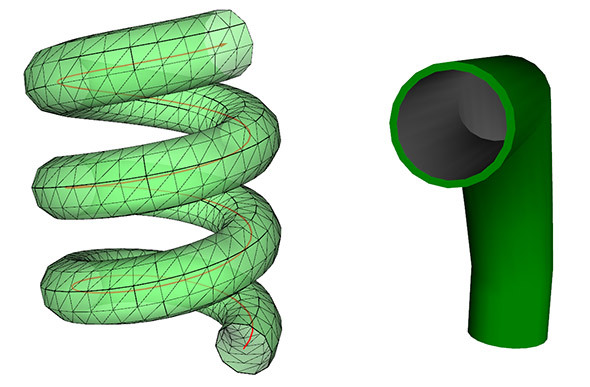 Added a new constructor to TubeMesh3D that takes different inner and outer radius of top and bottom of the tube. Added IsXAxisShown, IsYAxisShown and IsZAxisShown properties to ModelMoverVisual3D to allow showing only specifed arrows. Added MeshUtils.GenerateCylindricalTextureCoordinates method that generates TextureCoordinates based on the Cylindrical projection. 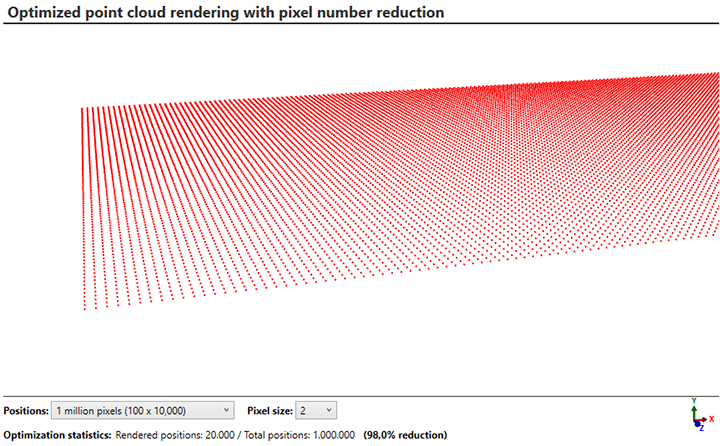 Added MeshUtils.Project3DPointsTo2DPlane to project 3D positions to a 2D plane. Improved EventManager3D to call MouseLeave, MouseEnter and other events when the camera is changed by MouseWheel. Added UpdateHitObjects method to EventManager3D - it can be used to manually update the current 3D object behind the mouse position - this is useful when camera is changed without changing the mouse position. Improved FreezeMeshGeometry3D property on BoxVisual3D and SphereVisual3D so that they do not to be set before all other properties. Added ModelUtils.HasAnyLight method that checks the Viewport3D, Visual3D or Model and returns true if any light is defined (it is possible to exclude AmbientLight). Changed default AssimpWpfImporter.AssimpPostProcessSteps from PostProcessSteps.FlipUVs | PostProcessSteps.GenerateSmoothNormals | PostProcessSteps.Triangulate to PostProcessSteps.Triangulate. Improved automatically setting shapeYVector in an overload of CreateExtrudedMeshGeometry that does not have the shapeYVector parameter. 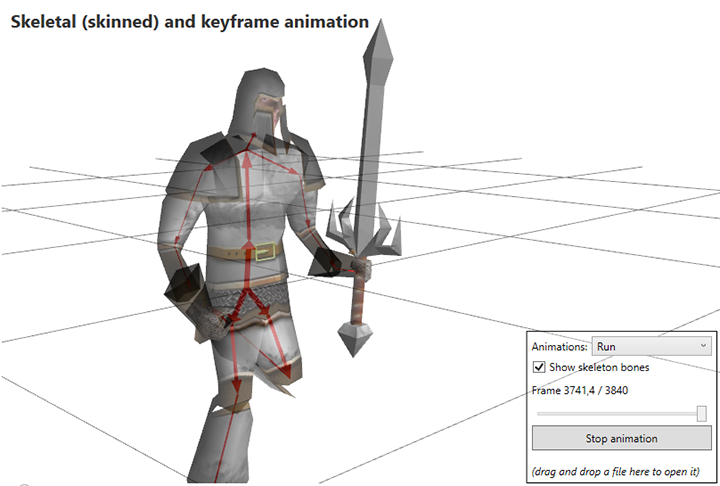 Fixed problems with ModelMoverVisual3D when it is shown inside DXEngine and AxisLength, AxisRadius or AxisArrowRadius are changed after the ModelMoverVisual3D is already shown. Fixed recreating 3D lines in cases when the parent ModelVisual3D is removed from Viewport3D, then the camera is changed and the parent ModelVisual3D is added to the scene again. I hope that you like the new features and stay tuned for next version. The plan is to add support for shadow mapping and great new ways to animate the camera in 3D space. I would like to inform you that today new versions of all the AB4D products have been published. The main reason for this release is that the evaluation and commercial licensing code that is included in all the products have been greatly improved. What is more, the deployment script that I use to prepare all release version have been improved. All products are now also compiled for .Net 4.5 target framework. This means that all products are available for .Net 3.5, .Net 4.0 and also .Net 4.5 (an exception is Ab3d.DXEngine that does not support .Net 3.5). This will allow using new language features in the libraries – especially async and await support. New evaluation and commercial licensing code is now faster and required less resources. New evaluation code allows starting ad-hock evaluation on a computer that do not have the evaluation version installed. This means that you will be able to create a sample project with an evaluation version and then just copy your application to another computer. At the first start of your application you will get a dialog to start a new evaluation and then be able to continue running your application. In the previous version you needed to install evaluation version on the other computer too. Improved commercial licensing code that brings new options to embed license key into your project and allows using special license key for application. This simplifies compiling projects on cloud base build servers and allows some other non-standard distributions. More details about that can be found in the new “Using commercial version” help file. The new version also introduces new directory structure that is created after the libraries are installed. In the previous version the libraries for .Net 3.5 framework were installed into “bin” folder and libraries for .Net 4.0 framework were installed into “bin\.Net 4” folder. Now the organization is much more standard: the .Net 3.5 assemblies are in “bin\net35” folder, .Net 4.0 assemblies are in “bin\net40” folder and .Net 4.5 assemblies are in “bin\net45” folder. This means that you might need to update your references. The new .Net 4.5 versions of the libraries will allow using async keywords. Currently this has not yet been added to any of the libraries. But in the near future I plan to add support for async to all of the libraries. 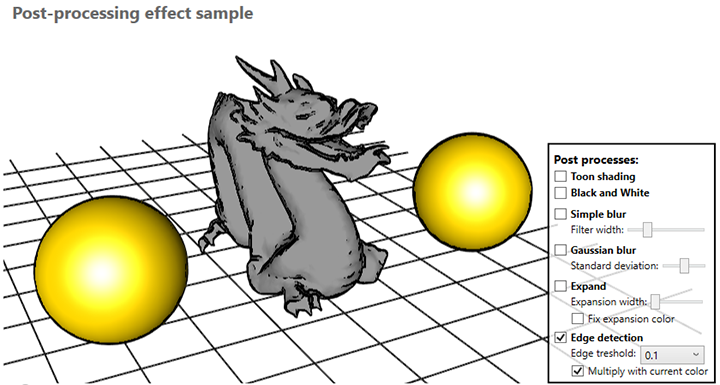 For example, async loading of 3D models or svg files. Another possibility is to create async methods to animate camera or ZoomPanel. As mentioned before, this release also brings other improvements and fixes. Ab3d.PowerToys got some great new features. The most highly anticipated feature is the ability to control the camera with 3D cube. 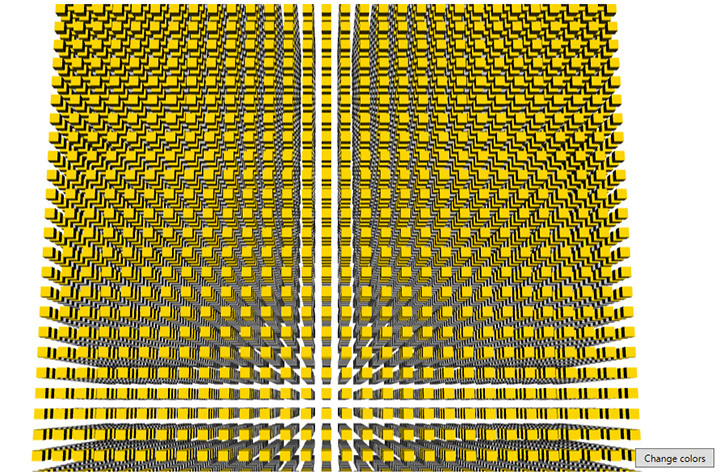 The image with three possible cubes was shown before. Added support to create extruded MeshGeometry3D that has custom orientation (not only in the direction of Y axis). This can be achieved with using a new override of CreateExtrudedMeshGeometry that also takes shapeYVector parameter. Added IsStartPositionClosed and IsEndPositionClosed properties to TubeLineVisual3D. Also added additional isStartPositionClosed and isEndPositionClosed constructor parameters to the TubeLineMesh3D. 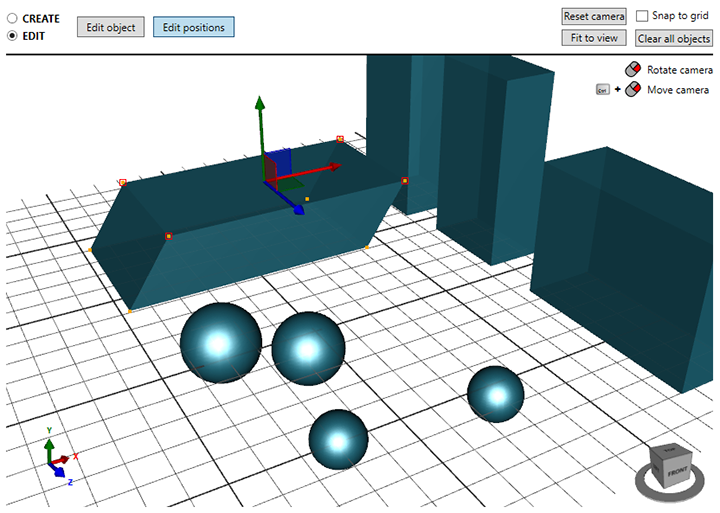 Added FreezeMeshGeometry3D to BoxVisual3D and SphereVisual3D to control if the MeshGeometry3D is frozen. Improved TubeVisual3D that now allows setting Height to 0 - this creates an optimized TubeVisual3D without creating both bottom and top ring - in this case only bottom ring is created. Fixed using adjustmentFactor in FitIntoView method. Fixed using FitIntoView when it is called in Loaded method and the Viewport3D is shown in Ab3d.DXEngine. Fixed type used by ShowMovablePlanes property. Improved MouseCameraController to capture the mouse only when the mouse rotation / movement is bigger than a few pixels. This prevents "swallowing" MouseUp event for processing mouse click in EventManager3D. Added UsePreviewEvents property to EventManager3D – when set to true the EventManager3D subscribes to Preview mouse and touch events instead of standard events - for example PreviewMouseUp event instead of MouseUp event. This can be used to use left mouse button for camera rotation and also for click events. Added TurnTo method to FirstPersonCamera - this turns the camera towards the specified position or to the specified direction vector. CameraControlPanel now moves the FirstPersonCamera forward or backwards when ZoomIn or ZoomOut buttons are clicked. When MouseCameraController is used for FirstPersonCamera the mouse wheel now moves camera forward and backwards. The library also got a few new samples. Two are to demonstrate the ViewCubeCameraController and TubePathVisual3D. There is also a greatly improved FirstPersonCamera sample that also shows how to turn the camera toward the clicked object. Another new sample shows how to create an application where user can draw to a 3D texture – for example to write annotation to a 3D height map. Ab2d.ReaderSvg library that can read svg files also got many new features. Another very interesting new feature is the new GetElementSvgText method that returns the outer xml text of the specified element. This can be very useful when you add some special attributes or elements to the svg elements. If those elements are not standard svg elements, then ReaderSvg cannot read them. But with using GetElementSvgText you can get the xml text from the specified element and then parse the data out of the xml. Added support for textPath elements (positioning text on a path). Added GetElementSvgText to get the svg text of the element with the specified id (can be used to read some additional svg properties that are not read by ReaderSvg). Added support for dx and dy properties on the text element. Fixed writing new line characters in XAML. Added support for vertical text (glyph-orientation-vertical svg property). Improved writing images in XAML that are now written in more clear XAML. Also fixed setting Source for images that are created from foreign objects. Added support for reading number lists that end with comma - for example "12, 34, 56," - this prevented reading svg file in the previous version. Improved support for rounder corners on rectangles in case when only rx or only ry is specified - in this case the other value is set to the same value. Other libraries got only a few updates. For example, the Ab3d.DXEngine library does not have any new feature in the core libraries but there are three new samples that show how to use standard DirectX rendering code inside DXEngine. The samples show how to render 3D cube with SharpDX code, use the camera and camera controller from Ab3d.PowerToys and mix the rendered 3D cube with other 3D objects from Ab3d.PowerToys library. Improved reading images with negative scale transformations. Improved positioning text for some special use cases (correctly position text based on the TextAlign mode). Fixed ResourceDictionaryWriter so that the ResolveResourceKeyCallback is called also for root keys. ZoomPanel library was only slightly improved – the number of history items was increased to 100. Also Ab3d.Reader3ds got only one improvement. The support for reading broken 3ds files has been improved so that some invalid positions that are not used in TriangleIndices are fixed. This prevents creating too big bounds value that is usually used to position the camera after the model is loaded. I am really excited about this release. It improves many aspects of the libraries that are not related to the core functionality but are needed because of licensing. It also enables many new features that are possible with .Net 4.5 and allows creating more user friendly APIs with async methods.